PopCap has removed the star of Thriller from Plants vs. Zombies and replaced him with the star of Saturday Night Fever. After PopCap decided to remove the Michael Jackson-inspired dancing zombie from Plants vs. Zombies to respect the wishes of the Jackson family, it still had to keep the character in the game. Its replacement first seen by PC Gamer sure can dance, just not as well as Jackson could in the 1980s. The new disco zombie is as packed with disco-themed accessories as it possibly could be. 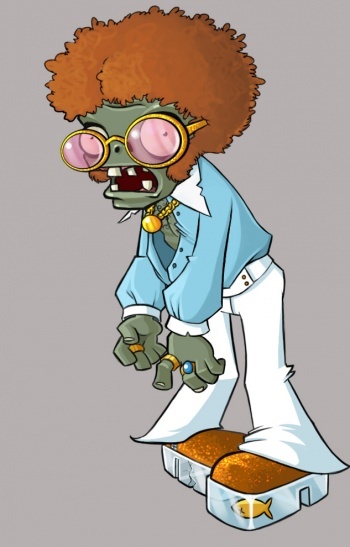 With tinted glasses, a massive afro and sideburns, a gold chain, a poofy shirt unbuttoned halfway down, bell-bottomed white pants, and platform aquarium shoes that house a dead goldfish, this zombie was probably a huge party guy before he became one of the undead. A member of PopCap told PC Gamer: "I confirm that there is in fact a new 'disco zombie' (see image attached) and I would really appreciate if you could 'be nice to the new guy'...the disco zombie is starting to feel like a second class zombie citizen, which is really unfair considering the length of time he spent doing his hair!" When you've got an eternity, I suppose you really can style an afro to perfection. The new disco zombie will appear in all future versions of Plants vs. Zombies so that PopCap doesn't get frivolously sued into oblivion.